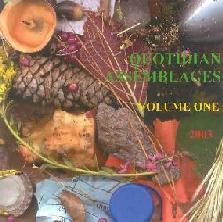 Various Artists - "Quotidian Assemblages: Volume One/Two"
Hal McGee has recently released the first two volumes of his International Compilation Series entitled Quotidian Assemblages, both of which feature 17 contributions from all over the globe of "audio works based upon ordinary everyday sounds". (Oxford American Dictionary: quotidian - 1. daily. 2. commonplace, trivial) In his call for contributions announcing the project Hal specified: Create an audio piece consisting of recordings of common everyday sounds from your life. No added instrumentation or synthesizers, or prerecorded loops or samples. How you treat, assemble, collage, effect, destroy and manipulate those daily sounds is totally up to you. The contributions on Volume One include some that are raw regurgitations of human activity, much of it the urban reality trip stuff that I seem to enjoy so much. We also get more sound-art oriented tracks that creatively blend clatter, tones and textures with daily activity. There's too much to run through them all, but among the more interesting entries is My Fun, which offers a full blown symphony of controlled cacophony. I felt like there was a groove to parts of the piece, despite the fact that it consists of clattering noises and voices. Mystified created the sensation of being in some kind of Notre Dame cathedral in space. Sputnik Weazel utilizes modem handshakes, rhythmic chatter and more to create a noise-art robotic dance piece. Jeph Jerman sculpts a very cool sound-of-the-seashore and tribal percussion piece. Liquid Sphere is another that offers an interesting spacey piece, this one having a darkest-regions-of-the-galaxy ambient feel. And Michael Thomas Jackson creates an interesting mixture of fuzzy noise waves, drones, clatter and human activity. 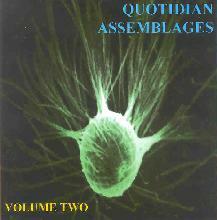 Volume Two consists of an equally interesting variety of contributions. I enjoyed listening to the widely varying examples of daily activity, and even more so their presentation, from the easily recognizable, to pure sound, and of course the many combinations of extremes. Among the tracks that jumped out at me was Mac from BIOnighT who contributes "Washing Machine", and does a good job of turning the rumbles and tumbles of the washer into a soundscape machine shop of noise waves and drones. Dave Fuglewicz's "Washed Out" is similar, and not just in the track title. Force yourself to listen closely to what seems to be so sparse... and you'll be surprised and what you hear. Straiph's "University Field Station" offers the activities within its setting in raw form, but with subtle embellishments that sound like looped bits and alien mumblings. Scott Taylor combines BBC news reports of the goings on in Iraq, Celtic music, and some slightly groove oriented voicings and noise waves, with the hussle and bussle of a train station or some similar place. And speaking of grooves, Brice D. Hornback creates a very cool head boppin' mechanical pattern for robots and the rhythmically afflicted. Carl Howard's "Dispension Of Notbelief" takes a gaggle of children and adds frightening howls and haunted house atmospherics to create a full cavern of dark space that sounds pretty wild given the contrast with the kids buzzing about. And Binter Timbre offers up a frenetic stew of raucous noise, voices and clatter. In summary, the Quotidian Assemblages compilations can be viewed as good collections of the works of numerous artists on the current sound-art scene, within the context of Hal's given theme. Artists will want to contact Hal about participating. But better hurry because April 1, 2004 is the deadline for the series. For more information you can visit the HalTapes web site at: http://www.hometown.aol.com/haltapes1.